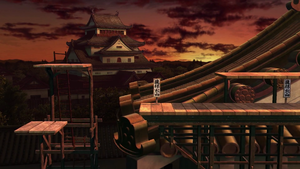 Suzaku Castle as it appears in Smash. Suzaku Castle (朱雀城, Suzaku Castle) is a stage in Super Smash Bros. 4, available as downloadable content in a pack with Ryu. The stage returns in Super Smash Bros. Ultimate. The stage takes place on the rooftop of the Japanese castle at sunset. It features two long walk-off platforms on the right side, and two smaller floating platforms on the left side. Only the lower platform on the right is solid. The position of the lower-left platform is a fair distance away from the main platform, and provides a challenge for more than one character to stand on it, allowing for camping. Signposts located on the longest platform will break if a fighter is launched past them. The signposts are eventually repaired after all of them are broken. In Super Smash Bros. 4, the Ω form of the stage consists of only the main platform centered without the smaller platforms and walk-off areas. The signposts can be broken even on this version of the stage, making it the only Ω Form stage to have interactive parts, albeit them being static. Both Ryu Stage Type A and B and Ken Stage Type A and B will change to become faster on the Ω form as well. In Super Smash Bros. Ultimate, the Ω form and Battlefield form are very similar to the Ω form in SSB4; however, the main platform is resized and reshaped to match Final Destination and Battlefield, respectively. The three soft platforms of the Battlefield form resemble the platform on the bottom left of the normal form. 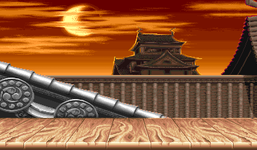 Suzaku Castle (Japan Stage) as it originally appeared in Street Fighter II: The World Warrior and Super Street Fighter II. 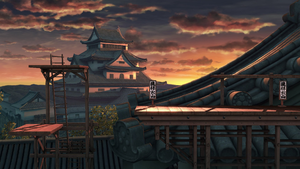 In Street Fighter II, Suzaku Castle (Japan) is Ryu's stage. Like all Street Fighter stages it is a simple flat surface with no hazards. The twilight setting and breakable signs in the Smash stage are inspired by the version of this stage which appears in the SNES version of the game. This stage is banned from tournaments (except the Ω form) due to containing walk-off blast lines, and that the stage layout forces most of the gameplay to take place on the right hand side of the stage. Suzaku Castle in Super Smash Bros. for Nintendo 3DS. Ryu entering the stage in Super Smash Bros. for Nintendo 3DS. Suzaku Castle in Super Smash Bros. for Wii U.
Bowser being knocked into the air by Bewear's attack on the stage. Chrom standing on the stage. Corrin idling on the stage. Greninja using Water Shuriken on Ryu on the stage. Mr. Game & Watch getting attacked by Ryu on the stage. Ryu using his forward aerial on a bike-riding Wario on the stage. Mii Brawler taunting on the stage. The start of the match on the stage with Ryu and Daisy. On this stage, if the current music playing is Ryu Stage Type A/B or Ken Stage Type A/B and either the timer has reached 30 seconds in a timed match; the last opponent has one stock left in a stock match; the last opponent's HP is under 100 in a stamina match; or during Sudden Death, a sped-up version of the respective song will play. This references Street Fighter II, where the stage music speeds up when a fighter loses half of their health. This also applies to the stage themes of E. Honda, Chun-Li, Blanka, Zangief, Guile, Dhalsim, Balrog, Sagat, Vega, M. Bison, Dee Jay, T. Hawk, Fei Long, and Cammy in Ultimate with both types. This makes Suzaku Castle one of the five stages in the Smash Bros. series that changes music when there is 30 seconds left during a timed match or when Sudden Death occurs, the others are Mushroom Kingdom (SSBM), Mushroom Kingdom (SSB), Mushroom Kingdom II, and Moray Towers. The kanji written on the destructible signs are "風林火山" (Wind, Forest, Fire, Mountain), a Japanese shorthand of the expression "As swift as wind, as gentle as forest, as fierce as fire, as unshakeable as mountain," in reference to The Art of War. These same kanji appear on Ryu's obi. Suzaku Castle is one of six stages in the Super Smash Bros. series to be featured as a stage in other fighting games, with the others being the Pyrosphere, Green Hill Zone, Fountain of Dreams, Midgar, and Dracula's Castle. Of these, Suzaku Castle is the only one originating from a fighting game. Despite being a Street Fighter stage, neither Ryu nor Ken are fought on this stage for their unlocking battles in Ultimate. Ryu is fought on Battlefield and Ken is fought on Boxing Ring. Suzaku Castle is the only third party stage to not have characters from the series make an appearance as background elements or a hazard. ↑ A battle on the original stage in Street Fighter II. This page was last edited on April 16, 2019, at 02:40.